We have been busy improving Uberchord, an app that helps you learn guitar chords with instant visual feedback. As you can see in the image on the right, the app uses guitar chord chart and symbols to display what chords you play on your guitar. For a single chord, there are many different ways to translate this into a symbol. 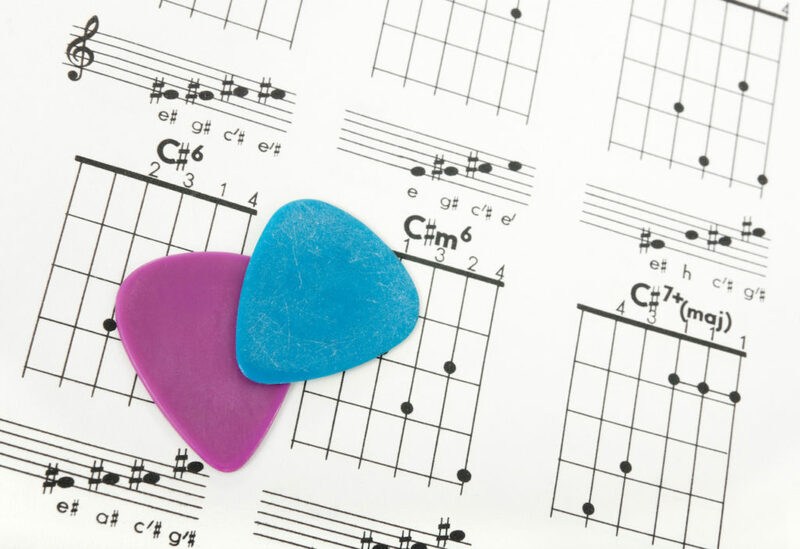 If you read through this post as a beginner to intermediate guitar player, you will learn a lot about how to read guitar chord chart and symbols. Before we get started, it is important to understand what exactly a chord is. The word chord means that three notes are being played at the same time. When two notes are strummed at the same time, this is called an interval and anything with three or more different pitches is called a chord. Since a typical guitar has six strings we will be examining chords that have three to six different notes. We have a music theory blog series with a lesson dedicated to “Chords“ if you are interested in learning more, be our guest. So you may ask, why is a power chord called a chord and not a power interval? Power chords are typically perfect fifth intervals (for example C and G), which means that the notes are harmonious with each other, making them sound powerful so to speak. The root note here is C.
Through extensive research on how familiar guitar chord symbols work, I discovered that there are many different systems. The only information that all chord symbols have in common is that they start with the root note of the chord and for that they use the name of that root note. The root note of a chord is the note on which a chord is built. For example, a three-note triad using C as a root would consist of the notes C-E-G. Many notes can be added to each of these triads, which is usually done in thirds. We call these “tensions” and they are usually written smaller than the root name and the triad type (min, dim, aug, sus4, sus2). In most cases they are listed on the right side, so generally chord symbols are read from left to right like a text (unless it’s hebrew or arabic). Seventh chords have 4 notes, the triad plus a seventh above the root. As explained above: since the major triad is the most used one it became a habit to not give any information except for the root note. If there is nothing else but the root name that means: major triad. Whenever we read “maj” somewhere, that means that a major seventh is added to the major triad and we have a major seventh chord. This is also written in one of these ways: maj, maj7, ma7, M7 or Δ. These are triads as well, but the third is replaced with the second (Csus2: C, D, G) or suspended to the fourth (e.g. Csus4: C, F, G). Their origin always resolves into a very consonant triad (C, E, G), although in pop and jazz they are also used outside that context. this is “sus4” and “7”. “sus4” is the triad type and “7” is a main characteristic for a dominant chord. 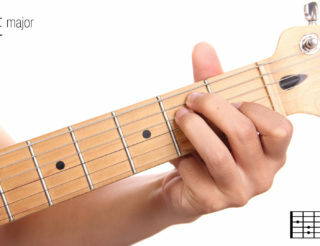 Normally, this would result in a symbol where the “7” would be on the right side of the “sus4”, which would make it difficult to recognize that this chord is dominant. So in this particular case we decided for our app to show the “7” above the “sus4”. The numbers tell their interval from the root. We already dealt with the sevenths. Then next we have b9, 9, #9, 11, #11, b13, 13. Since chord are built from scales and most scales have 7 notes, four of which are already occupied by the seventh chord, there usually will be a maximum of three more possible notes. We call any chord that uses altered intervals altered chord. If it has a #5 or b5 instead of a 5 or a b9 or #9 instead of a 9 and so on. There exists a symbol just saying “7 alt”. It means you can use any tensions from the altered scale for the chord. We don’t use it, as it is not specific enough. There are many common chord symbol shortcuts that musicians use. In Uberchord’s use of chord symbols we decided to avoid these shortcuts, and name every single tension of a chord so that our symbols will hopefully not be misunderstood. The result is not always the best readable, some symbols get very long. But establishing a system that is very clear seems much more important. For example using a “9” or “13” as the only additional information to the root note means that it is a dominant chord (major triad with minor 7), even though “7” isn’t included in the chord symbol. A dominant chord is with a major third and a minor seventh. C7: C, E, G, Bb – it is called dominant chord because of its function within chord progressions. Chord symbols can be very confusing. 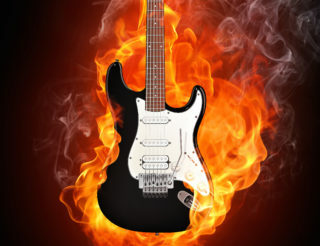 For our app, we had to find a way to use chord symbols that was consistent and easy to interpret by all guitarists. With 500 chord symbols and counting, we needed to find a consistent method to display chord symbols within our app. What makes this process the most challenging? 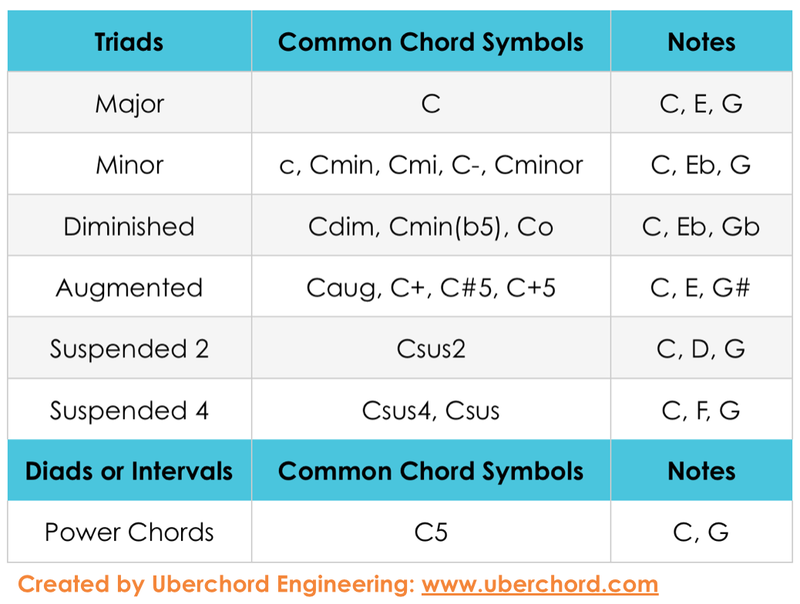 Uberchord includes this absolutely amazing list of ALL possible combinations of three to six pitches that can exist within one octave with a given mutual lowest note C. This list serves as a reference for the chord recognition technology, chord labeling and the graphic display of that symbol. I love this list! We made sure that it contains every single piece of information for literally every chord that can exist within the context of functional harmony. The Uberchord app also features chord symbols beyond functional harmony to some extent. The only chords excluded were those that have three or more pitches with only half steps apart from each other. Let’s call them chromatic clusters. No one would bother finding chord symbols for most of these. 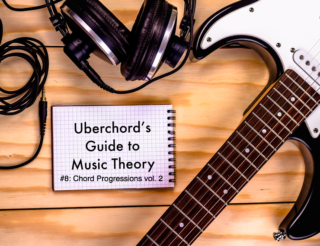 Behind the making of Uberchord – Fun Facts! Being a guitarist mostly, I can’t always play all the notes in a chord. I usually keep the top of the chord with the root. “C13” would be a Dm over a C in the bass. Is there a better way? Hi David, that is certainly one possible approach to that situation. Try to catch the tensions (like the 13 in chord you mentioned) but pay much attention to the basic functions of the chord, which are the third and the seventh (in case that is asked for). Also take care that these basic functions are somewhere below the tensions. The perfect fifth is always a good note to leave out. C13 is used for a dominant chord with major third, so the note F of Dm will not work, it will clash badly with the E. If you want to use the 11, raise it a half step to F#, the #11, so you get D major triad over C. In our app we will not use such a symbol as C13. Depending on which tensions appear we will call it C7 13, C7 9 13 or C7 9 #11 13 (but only if it is possible on the guitar, and it will show the fingerings too). Like that there will be no doubts about the notes the chord consists of. One last thing: any b9 interval between parts of a chord will sound weird. If the 7 is an octave above the 13, the minor third above the 9, and so on. Only exception is the b9 itself of course. Hey David, that’s a great question. Playing Dm won’t work well for a C13 chord since it consists of CEGBbDA. The F in Dm will clash. A better option would be to play C9 and simply leave off the 13th. Or play a higher voicing of Em7b5. Or Gm69. Both those over C will sound good. As long as you have the 3rd and 7th of the chord that’s the most important. There is a very interesting and important point about your comment: as soon as you don’t play alone but have a bass with you, there is no need to have the root in our voicing any more. Then most voicing can be all kind of chords, depending on the bass note. That will be difficult for our chord recognition tool but we will find some way to deal with that.